Brisk but evocative account of a tribal chief’s efforts to bury his dead son, which led to a landmark 1879 judgment that for the first time recognized Native Americans’ rights. Australian-born author Dando-Collins (Caesar’s Legion, not reviewed, etc.) deftly summarizes the legal arguments while offering vivid portraits of the diverse people involved: an open-minded general, a conflicted US president, an obstructive Secretary of the Interior, crusading lawyers and journalists, and a beautiful Indian woman whose eloquence helped the cause. In March 1879, Ponca Chief Iron Eye and his English-speaking daughter Bright Eyes came to plead the cause of fellow tribesmen Standing Bear and his followers, who were under military arrest at Fort Omaha, Nebraska. Commanding general George Crook, though tied by law, was sympathetic. In 1877, the Bureau of Indian Affairs had removed the peaceful and mostly Christian Ponca tribe from their lands in Nebraska and ordered them to settle in Oklahoma’s Indian Territory. They complied, but promises of help were broken, the new lands were infertile and unhealthy, and many Ponca died, including Standing Bear’s son. Wanting to bury the boy in his ancestral lands, Standing Bear had illegally escaped from Oklahoma, only to be caught and brought to Fort Omaha. The bereaved father’s dignified demeanor and painful story soon became nationally known as Henry Tibbles, editor of Omaha’s Daily Herald, launched a campaign on his behalf and found lawyers to defend him. 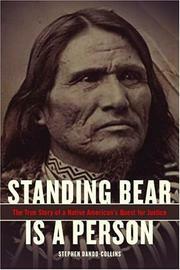 In May 1879, a judge ruled not only that Standing Bear should be freed, but that Indians had the same rights as whites to habeas corpus and to life, liberty, and the pursuit of happiness. This seminal ruling, however, would take years to be fully implemented and accepted. A dark moment in Native American history revisited provides an eloquent reminder of a fight well fought.